Although blogging has taken a back seat to other activities, I have been baking in the background. It's just that none of those have made the leap from the kitchen to the Web. And, frankly, most of them were old favorites and I really didn't have anything new to say about them, except for yum! This weekend, though, was different. My wife has decided to make some dietary changes, with the objective of greatly reducing the GI loads of the things she eats. On the one hand, that means eliminating a lot of foods that are either sugary or constituted primarily of simple carbohydrates and replacing them with foods that contribute either higher protein content or complex carbohydrates. So, when she had a package of 100% rye bread in her hand while shopping this weekend, I said "I can make that at home. And I can use sourdough, which will make it even better for you." All true but highly optimistic, considering some of my recent sorties into high-rye land. Back at the house, groceries unloaded and put away, I made a bee-line for TFL and started looking at the accumulated wisdom and experience regarding 100% rye breads. Of the various possibilities, Mini's Favorite 100% Rye was most appealing to me so I started the mise en place Friday evening. First up was to prepare the rye sour. Keep in mind that I pitched my old starter some weeks back and began another. So, while potent with yeast, the new starter is still fairly mild in flavor. It would have to do. Next up (although not in Mini's original formula) was a soaker consisting of 100g each of cracked rye and boiling water. Still another addition, a sunflower seed soaker consisting of "some" (about a handful) sunflower seeds and enough cool water to cover. Yeah, yeah, I know, always measure for repeatability. I was off the page at that point, anyway, so measurements didn't seem too important. After that, off to bed. The next morning, I toasted the bread spices in a skillet on the stove top and ground them. Not knowing the exact formulation, I guesstimated that 2 tablespoons of coriander seed and 1 tablespoon each of caraway and fennel seeds should do. Oh, my, the house smelled wonderful! From previous experience, I knew to keep an eye on the fennel seeds; they start out with a greenish cast and turn a golden brown when ready. The caraway and coriander start out a tan/brown color, so they aren't as helpful in indicating when they are done. It is important to give the seeds a shake every minute or so to prevent scorching. From there, it was a matter of combining the starter, the water, the spices, the cracked rye soaker, the (drained) sunflower seed soaker, and rye flour. It's a bit of a stretch to refer to a 100% rye dough as "dough". Wet mortar seems to have a closer similarity to this stuff than any dough based on wheat flour. Anyway, the ingredients were thoroughly mixed, covered with plastic wrap, and left in the sunshine on our stoep. We're seeing the first signs of Spring here in Pretoria and the sunny stoep was warmer than my kitchen. An hour later, I brought the bowl back in, troweled the dough onto a wet countertop and worked in the salt, per Mini's recommendation. The dough was put back in the bowl, covered, and set back out in the warmth of the sunshine. At the 3-hour mark, the mortar/dough was showing some aeration, which indicated that the starter was at work. Since the cooking gear available to me is a bit different than Mini's, I elected to split the dough into two loaves and bake each in a 4x8 (inches) loaf pan. Those fit neatly into a covered roasting pan, giving me the steam chamber that Mini devised by flipping one pot upside down on top of the other. Having oiled the pans and dusted them with rye flour, I brought the dough in, divided it into two pieces, shaped each, and gently tamped them into the waiting loaf pans. Each pan was approximately half full, giving me a reference point for gauging their eventual expansion. Just to be sure that I didn't miss anything, I also lightly sprinkled the loaves' surface with rye flour, knowing that the resulting cracks in the flour would be another indicator that the dough was rising. After that, I covered each loaf pan with plastic, put them in the roasting pan, covered it, and set the whole shebang back out in the sunshine. Two and a half hours later, or five and a half hours into the process, the loaves had filled the pans about 3/4 full, which was about a 50% expansion. 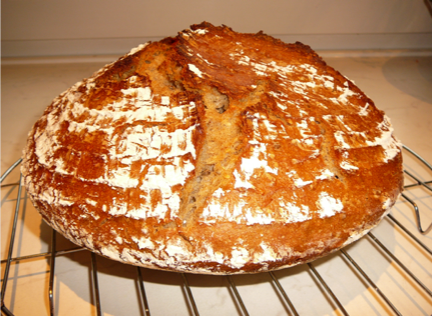 The top was a network of dark fissures in the lighter rye flour. After debating the merits of allowing further fermentation/expansion versus the possibility of over-proofing, I decided to err on the side of caution and bake the bread. I did remember to remove the plastic wrap (whew!) from the loaf pans before sliding the roaster into the oven. I also chose to sprinkle a tablespoon or so of water in the floor of the roasting pan, just to add some more steam. Maybe that helped, maybe not. Per Mini's instructions, the bread went into a cold oven, then spent the first 25 minutes at 200C in convection mode. After that, I took the roaster out of the oven, pulled the loaf pans from the roaster and put them back in the oven, then switched the oven from convection mode to a top and bottom heat mode, still at 200C. Not knowing exactly how long they would take to reach the recommended internal temperature of 93C, I checked back in 20 minutes. The internal temperature was barely 91C, so I gave them an additional 5 minutes. At that point, the thermometer showed 94C, so I removed the bread from the oven and depanned the loaves onto a cooling rack, covering them with a cotton towel. A few hours later, after they were thoroughly cooled, I put each in a plastic bag. If you read Mini's account and compare it to this one, you'll notice that the added soakers and the division into two loaves are not my only departures from her formula. 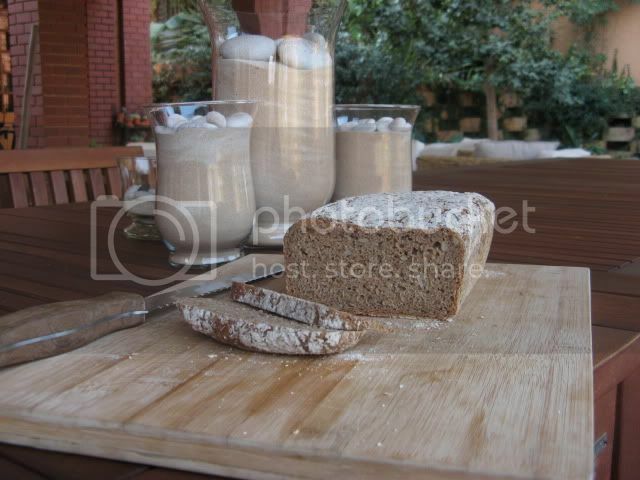 She is working with a finely ground rye flour (Type 950, I think) that, back in the States, I might call a medium rye. What I have available is a stone ground whole rye with noticeable flecks of bran. I think that my dough was a bit stiffer than she describes hers, probably because of the additional absorption of the bran. Consequently, I wasn't bashful about working additional water in from either the countertop or my hands. Having given the bread 25 hours to for moisture distribution and stabilization, I cut into one of the loaves this afternoon. Several things became evident. First, I could have allowed the ferment to continue longer. These are not bricks but neither did they achieve the airiness of crumb that Mini's bread shows. My concern about over-proofing made me a little too twitchy. I think that is going to be one of those experience things (with probably at least one flop) to know how much is enough and how much is too much. Second, the bread spices that were so evident during the baking have taken a backseat to the rye itself in the finished bread. They are still in there, but they are the background singers to the rye's lead (if we were talking music). The sunflower seeds add a bit of nutty crunch and flavor to the blend. The crumb is very moist and cool but not gluey. Were it not for the textures of the the cracked rye and sunflower seed soakers, it would be almost cakelike; albeit a very dense and chewy cake. There's a lot going on in this bread and it's only Day 1. I'm curious to see how the flavors evolve as the bread ages. Most importantly, my wife likes it! Since it was intended for her benefit, that's a good thing. 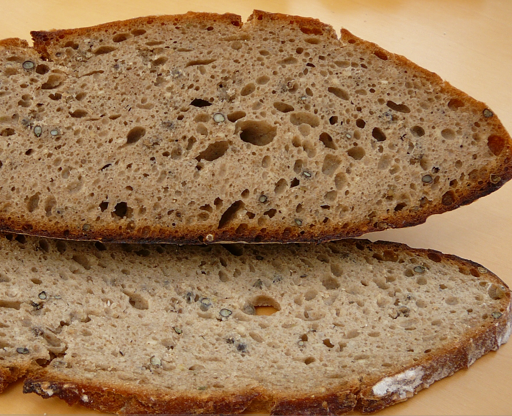 The first picture, below, shows the loaf profile and crumb. Like I said, not a brick but more proofing would have been allowable. 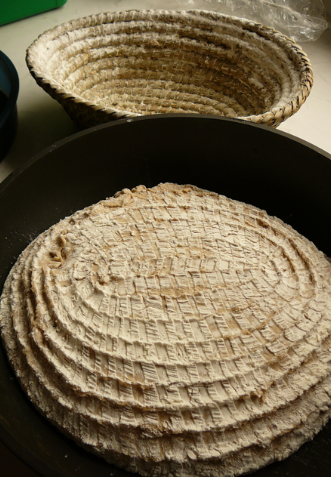 The second picture, below, shows the "crackle" texture in the flour sprinkled on top that was caused by the loaf's expansion during proofing. There are things that I might do differently next time. I'd probably skip the rye flour dusting in the loaf pans and use a solid fat instead of oil. The oil/flour residue on the sides of the loaves isn't visually appealing to me. I might also skip the dusting of flour on top of the loaves. It was my choice rather than anything Mini recommended and I don't know that it helped me to ascertain readiness as much as I had hoped. Oh, and I would try to remember to dock the loaves prior to baking. That step got left out entirely and it was probably only because the loaves were somewhat underproofed that I don't see any problems as a result. Thank you, Mini, for sharing your formula with us. Once I feel like I have a handle on this bread, I'd like to try some that have a very long, low-temperature bake to see if I can approximate a pumpernickel that is baked in a WFO overnight. What a nice husband you are, making a complicated rye for your wife. I suspect the freshman status of your starter is the cause of the dough being more dense than you would like. I have found that if I don't make an attempt to rev up the starter activity, the results are more dense. How's the adventure going in SA? that is to blame for the bread's density. It had already expanded visibly and I still had a couple of hours to go before getting beyond the 8-hour window that Mini recommends as the outer limit before bad things start happening in rye fermentation. Nope, fear triumphed this time. Now that I have this as a reference point, I know that I can push further the next time. This is wonderful stuff to eat! I just polished of a ham and cheese sandwich made with the bread and it was delightful. I suggested to my wife that she might want to experiment with drying/toasting some thin slices to make a crispy snack food. We'll see if she pursues that notion. The adventure, like all adventures, has its ups and downs. For the most part, we are enjoying ourselves immensely. We are planning a trip down to the Cape to watch the whales that congregate there every year for calving, for instance. We enjoyed a long weekend in KwaZulu Natal a month ago and spent most of it poking around for goods made by local artisans. Stuff we bought included: hand-woven mohair throws, pottery, a grass basket, quilts, a hand-turned wooden bowl and cheese. Stuff we didn't buy included: jewelry, leather goods, furniture, preserves, wine and a lot more. South Africa has so much to offer that I know we won't have seen everything we want to before the assignment comes to an end. I'm glad for having been given the opportunity. I like a lot the look of your loaf, but what you wrote about the spices really surprised me. I gave up adding any spice to my rye bread because -even in tiny amounts and untoasted- kummel, fennel and coriander seed were seriously overwhelming the taste of rye itself. Just rye for me, thanks;-) . As for the pan I use a no-stick and perfectly rectangular pullman pan that I grease with butten once in a while only when I see signs of sticking after a baking, thus I put absolutely nothing in it: no oil, no butter, no flour. No additional aftertaste and no sense of fried! Perhaps your tasting abilities exceed mine? Based on the aroma while baking, I was fully expecting a spice-forward flavor when I bit into the bread but was surprised to find the rye is dominant. And in a good way. My preferred approach is to use a solid fat for greasing bread pans. I had come across the recommendation for oiling and dusting somewhere along the way and thought "Why not?" Now I know the answer to that question. It's back to my usual practice. Well, Nico, the spices are back today! And they are the first thing I noticed upon taking the first bite. As I chewed, the rye gradually asserted itself, slowly edging the spices off to the side. It's very interesting how different flavors assert themselves as the bread ages. In my case, the spices are a welcome part of the mix. Great Write-up Paul! Lovely Loaf you have , Rye is king, no matter how it end up. I hope you enjoy yourself there , at least until it lasts. Wheat just tastes too good for me to abandon it but I understand your appreciation of rye. It's an entirely different world of textures and flavors. I'm honored and very pleased! Your loaves came out well for the first attempt! I was making a 70% rye 84% hydration the other day using the same ratios. It was much faster than 8 hours (the max) closer to 5.5 hrs with summer. A little bit of gluten, even as delicate as spelt, helps quite a lot, doesn't it? And I like the basket, too. and rye. It contains many overlapping characteristics when compared, it benefits from a sour but doesn't behave like cement. My loaf might have been a pancake if not for the wok. There was no surface tension and because I wanted to use the basket, I did not pick up the dough and fold it wet like I normally do. I wanted to keep it dryer hoping it would stick less. Yes, your loaves do have some heavy seeds in them weighing them down. Did you try folding the dough gently before shaping? It seems to help a great deal. Try not to flatten the dough intö the form but let the shaped loaves retain their rounded shape. They flatten out on their own. My basket looks pretty crappy at the moment. It's dried out and I should go bang out the flour and dough chunks somewhere in the garden. I think I can trim out the rough parts that hang up the dough. Incredibly absorbant material, that grass. It's nice too that it is cooler here while you're enjoying that it's getting warmer there. Funny how that is. I had the oven on for roasting a pair of chickens. Didn't mind at all that they warmed up the kitchen. They were all so good! After we picked them over I removed the meat from the bones and threw everything else onto lightly sautéd onions and celery and started what may turn out to be a great soup. The whole house smells like chicken soup. Vey Nice 70% Rye mini! i love the crumb. BTW what type of rye flour have you used? and could i use Whole Rye flour instead? 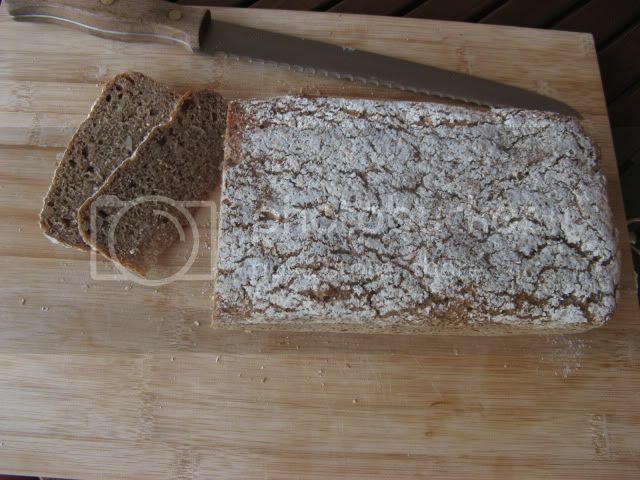 Rye #960 here in Austria, then wheat #700 (a bread flour) and whole spelt flour. With ratios using 170g rye starter (100%) the rye was 500g, the spelt and wheat 100g each. I added 80g each hemp seeds and white unroasted sesame seeds. Bread spice also included. For a guy who bakes wheaten breads (even my ryes are usually less than 40%), taking the plunge into a 100% rye is like walking into a different world. The stuff behaves so much differently than wheat and requires a different set of techniques. If you want to walk on the rye side, I'd recommend Mini's formula. She has done an excellent job of describing the process and the dough's behavior. My wife tells me it makes excellent toast and that the toasting brings the spice flavors roaring back to the front. She, I think, appreciates the blend of spices more than she would a straight caraway rye. I think that the crumb that you achieved using your flour is quite good. More proofing would have led to a repeat of the rise and fall of the Roman Empire right there in your oven. I can see this from the ever so slight concave top on your loaf. The crumb that Mini creates is most definitely a result not only of her skill but her flour as well. I have baked a good many 100% ryes using a variety of flours and can achieve a crumb like that of Mini's only through finely ground rye. All in all I would say that your result is a really good bread and I would make only very minor adjustments going forward. Yes, our flours are different, with mine being more coarse. If that's as good as it gets with this particular flour, then I'm a happy camper. Especially if I avoided an overproofed pancake. Paul, do you have a separate oven thermometer and if so, when the oven is on 200°C with blower, does it read 200°C? Maybe your oven turned itself down automatically. Mine will get up to 250°C in convection. I was wondering about the saddle back top too. Was it flat or domed when it went into the oven? Mini, you have one (more) point: I measured the temperature of my oven with 2 different thermometers, and after 1 hour both read a max value of 180°C even when I set 250°C. I'll have to look at the manual to see if it says anything about automatic temperature reduction. My oven back in the States does that, I think. The bread was ever so slightly domed, just barely above being flat-topped, when it went into the oven. Maybe (this is a guess) 4-8mm higher in the center than at the edges? Do you think that a lower-than-advertised temperature may have prevented the crumb from setting before a collapse began? Or that it wasn't hot enough to drive steam formation inside the loaf, therefore preventing/minimizing oven spring? I think I agree with Yerffej, that your crumb is pretty open for a 100% rye. My best suggestion is to try and use a tall narrow tin, rather than a squat wide one, if you see what I mean. The former just flatter the final loaf so much more. You are so right to want to avoid overproof. At the latter stages, the paste becomes very unstable as the pentosans break down. There really is no recovery once that point is reached. Thank you very much for writing this up. It's a great post and a very fine first attempt at 100% rye. I'm thinking you are wanting to do quite a bit more experimenting. Welcome to the fabulous world of high rye! Yes, more experimentation is called for. And one of those experiments can be with a different shape loaf pan. I can see how the taller profile might also make the degree of expansion more visible. Rye is, indeed, a world of its own.